How can you weave theological teaching into their daily lives, without necessarily setting them down for an in-depth family sermon (though there is nothing inherently wrong with that)? How can you impart good theology into the lives of your children, without possessing a theological degree (though hopefully there is nothing inherently wrong with that)? You don’t need to feel like you’re trying out the latest parenting fad or complicated system. If you are like me, you’ll try it for a month or two and then give up because it didn’t feel natural. 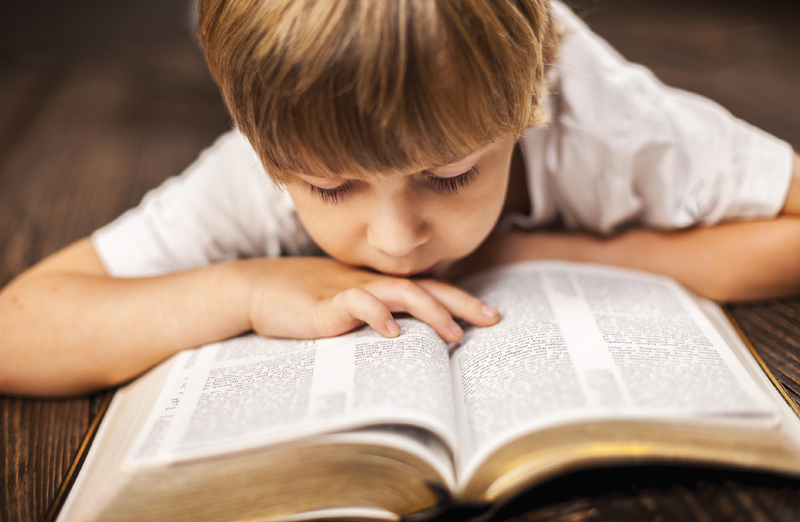 Instead, here are five simple ways to teach your kids theology virtually every day. It seems obvious, and it is, but it is the foundation before anything else. Why not let God do much of the teaching for you? He has given us His word with the Holy Spirit who works in the life of the believer to help illuminate that word. By reading the Bible to your children, you’ll allow God to speak through His word, while demonstrating that Scripture is important to you and your faith. Use it before anything else. Will you come across passages that you don’t understand? Absolutely. Will your children ask questions that you don’t know the answer to? Sure. Both of those are actually beneficial to your children and your own Christian walk. They can see that their mom and dad are growing too. They’ll know it’s okay to ask questions and wrestle with some of the hard things in their faith. Hopefully, it will inspire both you and your child to seek answers through your own personal studies and also using some other sources of good theology. Some of the memories I cherish the most have been times of reading to my children before they go to sleep. Along with the Bible, we’ve read devotional books, classic fiction, Christian stories and several others. I don’t have to start a discussion time with them, they naturally asked questions. Because of our reading the books together, both of my sons are practically experts on all things Narnia and Middle Earth. They often remember scenes from the novels better than I do. They also caught the spiritual themes before I expected. As we read through The Lion, the Witch and the Wardrobe, they commented about how Aslan was sacrificing himself just like Jesus did. I didn’t have to tell them that or develop a lesson for that. They naturally got it. And yours will too, if you make a habit of reading them good stories that reflect the great story. Honestly, this is one that I accidentally discovered with my kids. In praying with them at night, I would try to always pray with the Gospel in mind, with the ideas of creation, fall, redemption and restoration at the forefront of how I talked to God. Thanking Him for the goodness He made, how we messed it up, but how He opened the door for us to be redeemed through Jesus’ death on the cross and how, ultimately, God is going to restore things back to the way they should be. One night, I heard one of my boys praying about how he got a scratch on his leg because this world was fallen, but that God still had good things here. The leg could be healed and God was still here. Those were good things to be thankful for, even though the world is fallen. My son had picked up on that from my prayers. Be specific and intentional about what you are talking to God about with your children. Use that prayer time to speak to God, but also cause your children to think theologically. This one is an opportunity that many parents fail to capitalize on. Most families watch some television or movies, read books or do something for entertainment. Some times those entertainment choices may line up fairly close with your values. Often times the entertainment, even (perhaps, especially) children’s shows, lies in direct contrast to your perspective as a Christian parent. What do you do then? Use both of those situations to create theological conversations. It doesn’t have to seem deep and philosophical in order to be important and impacting. Reinforcing that, no, we aren’t a cosmic accident that just purposelessly evolved, can create a lasting reassurance in the mind of your child. Evaluate the entertainment—music, movies, TV, video games, everything—in light of a Christian worldview, through the perspective of Scripture and just talk with your kids about what they just saw or heard. It will help them to see how their faith should be involved in every aspect of their life. This may be the most difficult, but it is absolutely the most important. Live out your faith in front of your kids, even when they no longer think you are the greatest thing ever. Even when they know you make mistakes your kids may have thought you wore a cape when they were younger, but, at some point, you clearly can no longer wear a mask. They see you and how you live. If you say you value Christ, His commands, and His church, but you can’t be bothered with going to services on Sunday because the big game is on or the golf course is “calling your name,” then what you say is pointless. It’s not a matter of being perfect—again, your children know better than anyone else you aren’t. It’s about being consistent and seeking to live for Christ and admitting when you mess up. After all, that probably needs to be modeled more than anything else. Have the humility to acknowledge your own shortcomings, ask them for forgiveness and help them see they can always turn to God for forgiveness. It is our job as parents to teach our children theology. It can be intimidating, but it doesn’t require a seminary degree. You can help your kids know and love Jesus more. Read 382 times	| Like this? Tweet it to your followers!